I feel it’s important to start off with this review and say, if you’re in any way depressed, or easily depressed, you’ll probably want to steer clear of the first volume of this excellent anthology. It takes the word “dark” in its title seriously. 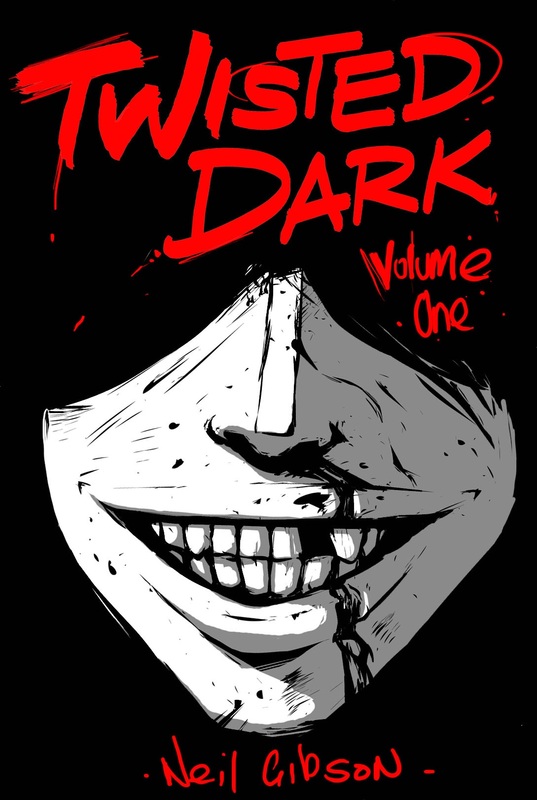 Twisted Dark Volume One springs out of the brain of writer Neil Gibson. The title evokes the idea that we’re in store of a bunch of stories filled with dark humor and dark places and that pretty much nails it. And it’s an excellent read. Gibson is back up with varied artists, most offering more than one story. Though they’re different names, the style if art is pretty similar with a rough look that fits the tone of the stories quite well. The graphic novel, while made up of stories that vary in characters and plot, has a clear coherent vision that carries throughout it’s pages. The dark, twisted, humor is clear right away as Gibson explains the difference between himself and Mel Gibson, they’re not the same person just to be clear. From there the stories are all over the place and each leave you haunted by the end. I was sucked in by the quality of the storytelling while at the same time thinking what’s wrong with me that I’m enjoying it so much. There’s a twisted beauty about it all and the content is not for the squeamish. At almost 200 pages, the graphic novel hit me like a punch to the gut, torturing my emotions in a good way. The fact that Gibson pulls this off automatically puts him on my radar as a writer to watch. It’s an impressive move to evoke such emotion and get the reader to feel it as they move through the stories. The fact it’s his debut is even more impressive and puts many veteran comic writers to shame. While most of the stories stand on their own, there’s a two that are interconnected hinting that there’s even more going on here than meets the eye. If you’re looking for a solid read that’s haunting and hits you on an emotional level, look no further. The fact that it’s an indie publisher is even better. I absolutely recommend this and look forward to see what Gibson has in store next.